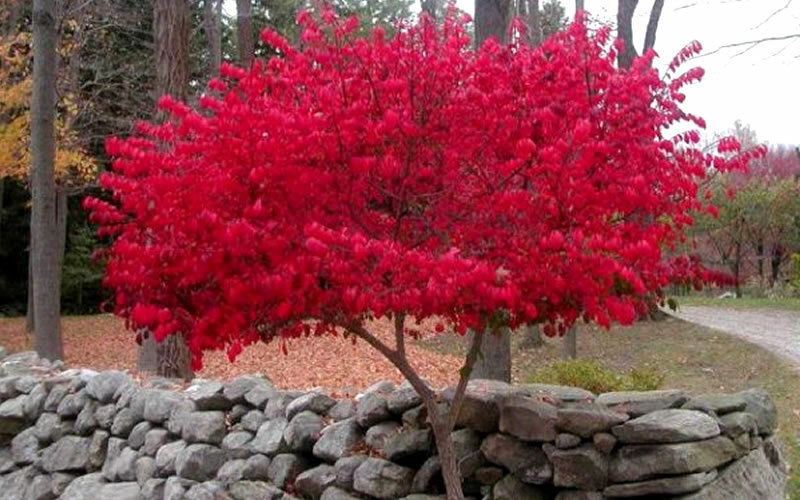 Set your landscape on fire in fall in a good way with this low-maintenance favorite! 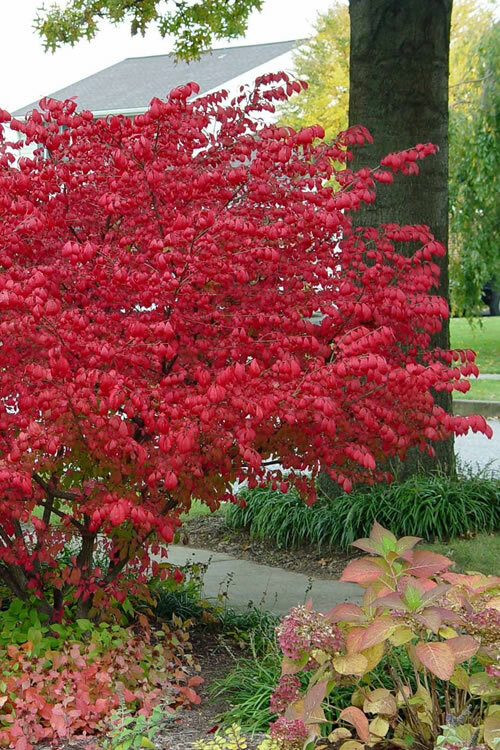 The Dwarf Burning Bush is one of the most handsome of all shrubs featuring deep green foliage that turns to a stunning fire-red in fall on a stately vase-shape form. Get all the details below! Set your landscape on fire in fall in a good way with this low-maintenance favorite! 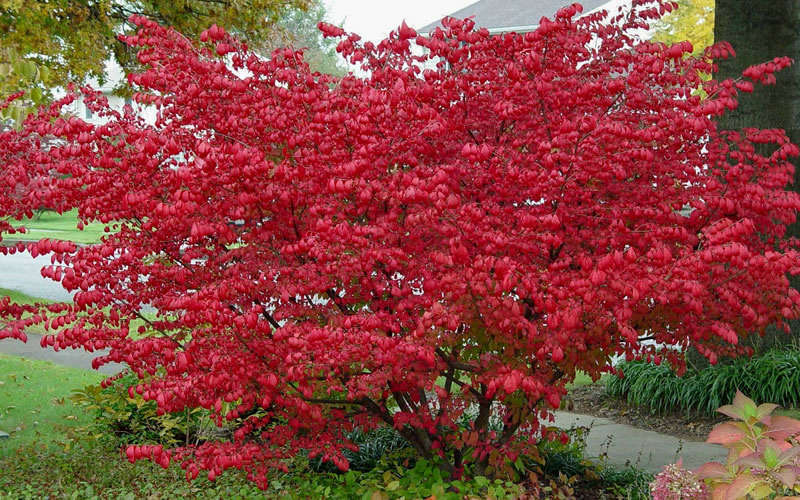 The Dwarf Burning Bush is one of the most handsome of all shrubs featuring deep green foliage that turns to a stunning fire-red in fall on a stately vase-shape form. 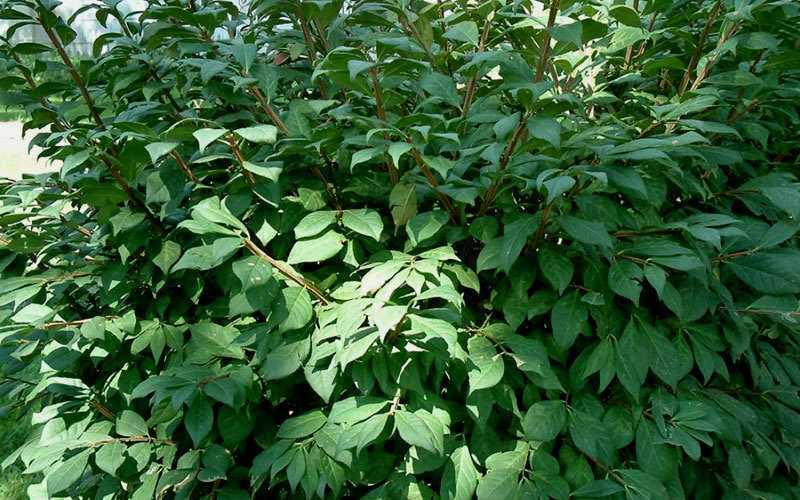 The ends of branches are somewhat pendulous which adds even more appeal to this already marvelous shrub. Red berries and unusual corky bark add interest in the landscape during the winter. No pruning ever required. 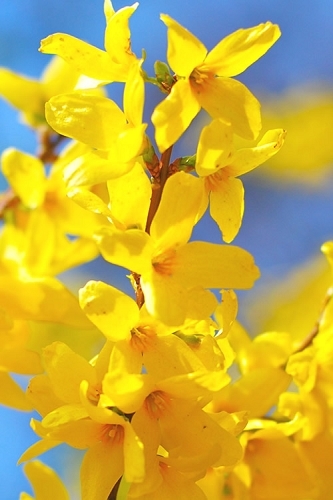 With an upright habit and vase shape 6 to 10 feet tall and wide (depending on pruning), the Burning Bush is ideal for use as a colorful specimen, in groupings, or as a natural hedge in landscape borders or as an accent or between widely spaced windows in home foundation plantings. A fine addition to rock gardens, red theme gardens, and Xeriscape gardens (low water needs). 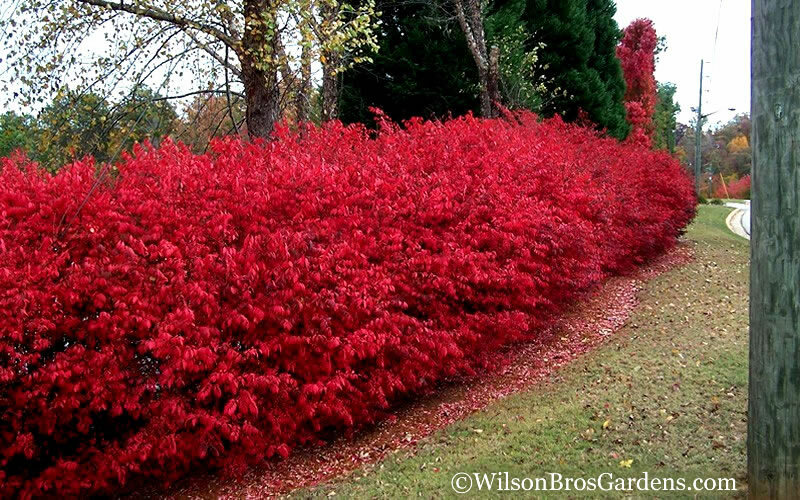 When planted right and in the right spot, Dwarf Burning Bush is very easy to grow. 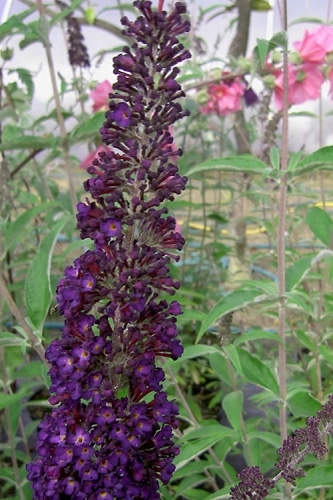 When established, it is exceptionally low maintenance and drought tolerant. It adapts to a wide range of soil types provided they are well-drained. 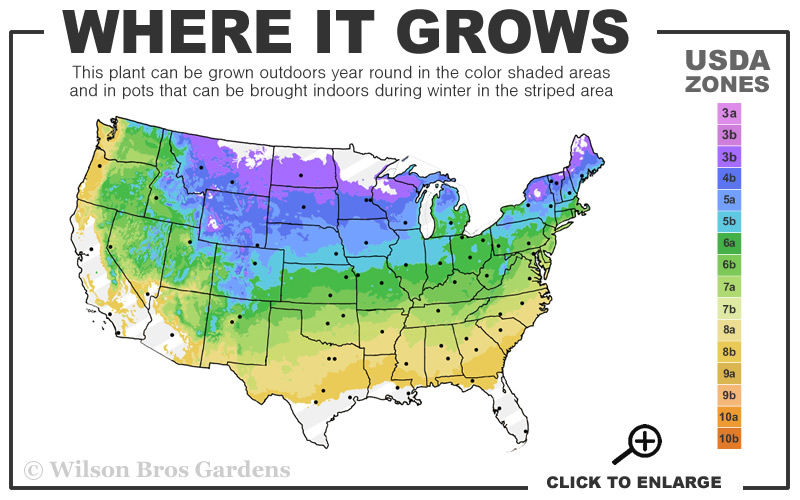 It will grow in part shade however displays the best fall foliage color in full to mostly sun. We suggest at least 6 hours of direct sunlight per day. When given room to grow to it's mature size there is no pruning required. 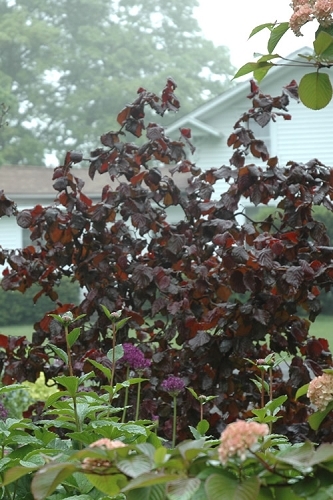 Click on the link below to find helpful advice from our experts on planting, pruning, fertilizing and watering Burning Bush. Foliage Color: Dark Green; Blazing Red in Fall! 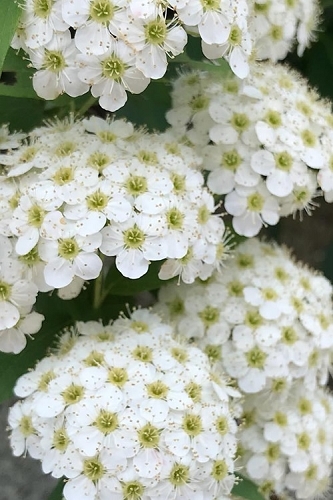 Received well-branched plants of good size. No leaves but its winter. Look forward to seeing the plants leaf out in spring.